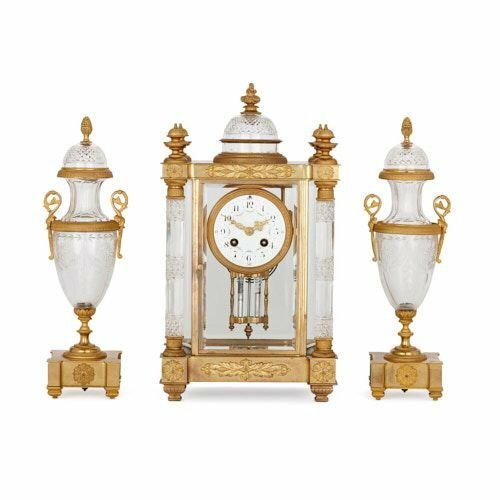 This exceptional antique clock set is notable for being crafted from clear glass, which is intricately faceted and incised, and finished with fine ormolu mounts. The set is comprised of a central clock, which is flanked by two vases. The items are similarly designed in a refined Neoclassical style. The central clock stands on a shaped, rectangular ormolu plinth, which is raised off the ground by four fluted bun feet. The plinth is decorated, on its front, with a central symmetrical foliate design, flanked on its projecting ends by rosettes. Two columns stand on the plinth and flank a tall rectangular clock case. These columns have ornate ormolu bases and capitals, and glass shafts, each decorated with three faceted bands. 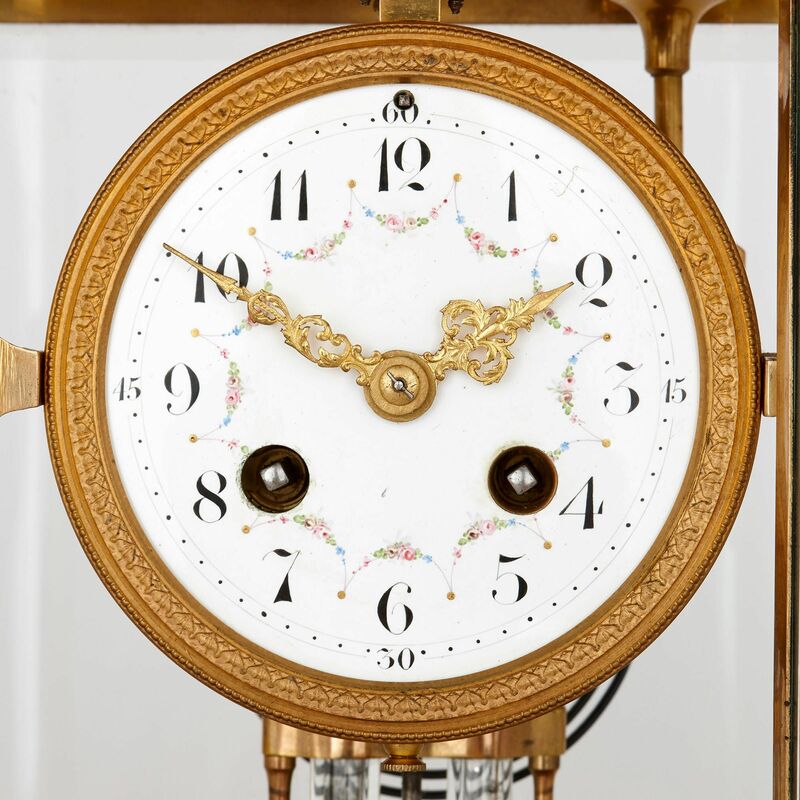 The case is composed of clear glass, and encloses the circular white enamel clock dial, which features Arabic Numbers, decorated with painted floral swags. 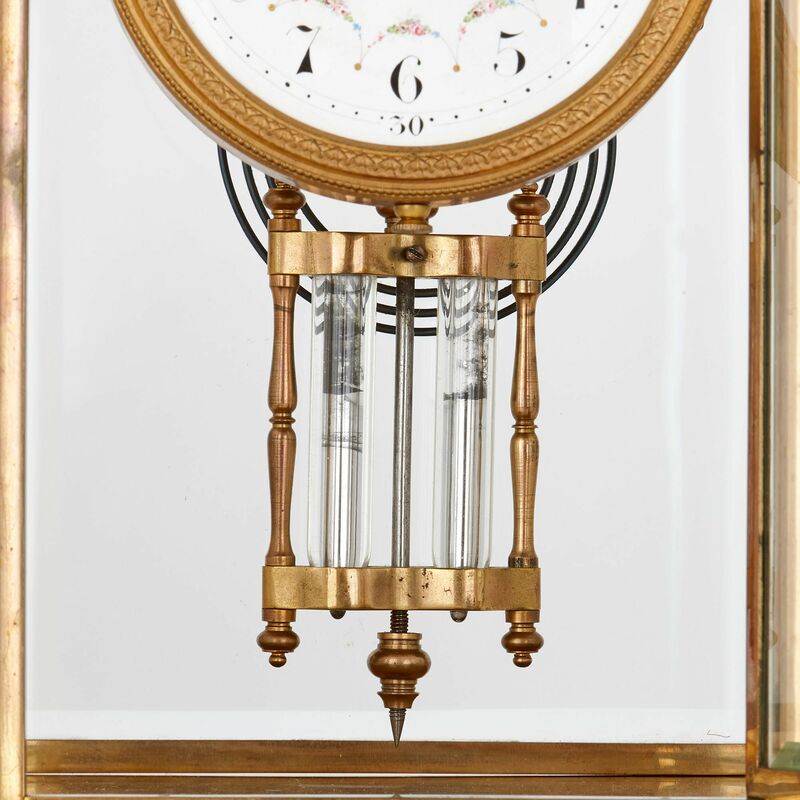 The dial is set within an ormolu case, and a pendulum, with a pointed end, hangs in the space below. The columns and glass case are topped by an ormolu architrave, which is decorated in a similar style to the plinth. This is surmounted by four dome-shaped ormolu finials, with ball tips. These finials flank a central faceted glass dome, which sits on an ormolu base, is ringed by a band of ormolu, and topped by a floral, ormolu finial. 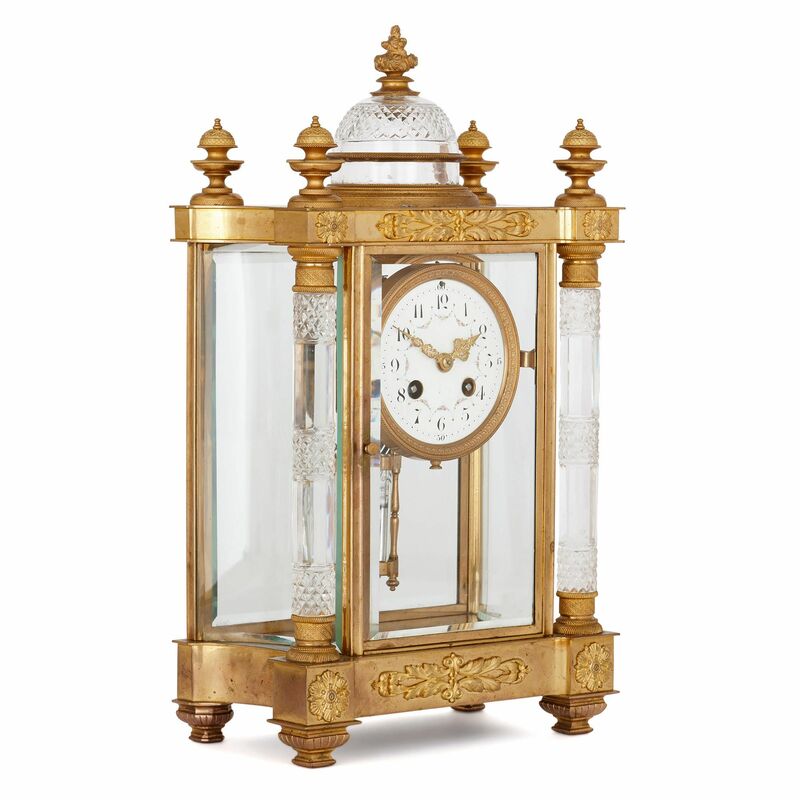 Accompanying the central clock are two vases, similarly crafted from ormolu and cut glass. These stand on waisted square plinths, decorated on their fronts with rosettes, set on four bun feet. 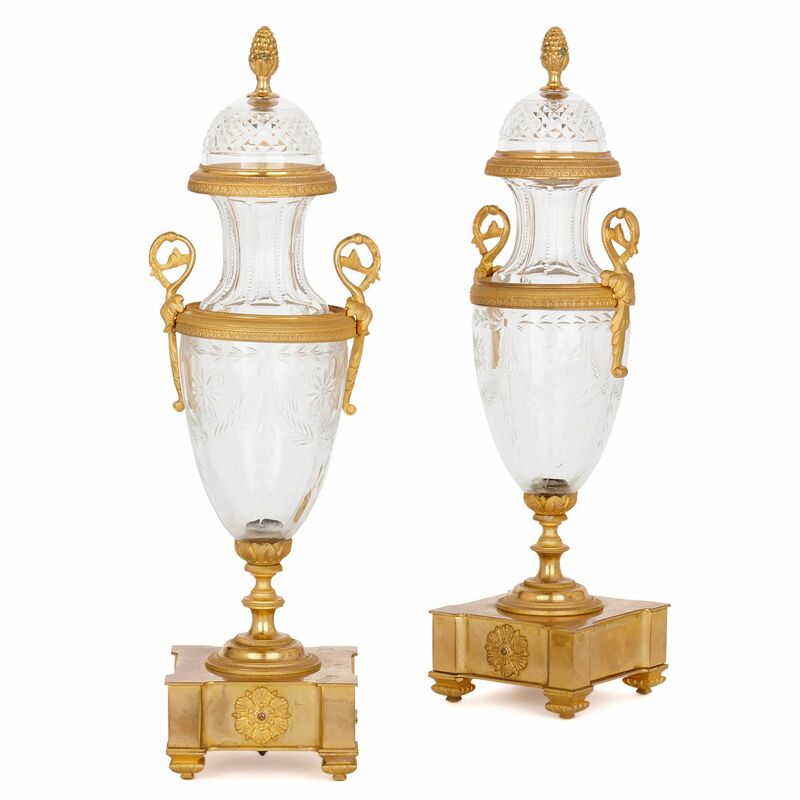 The vases feature splayed ormolu stems, and glass bowls with wide upper bodies and tapered bases. These are finely incised with floral designs. 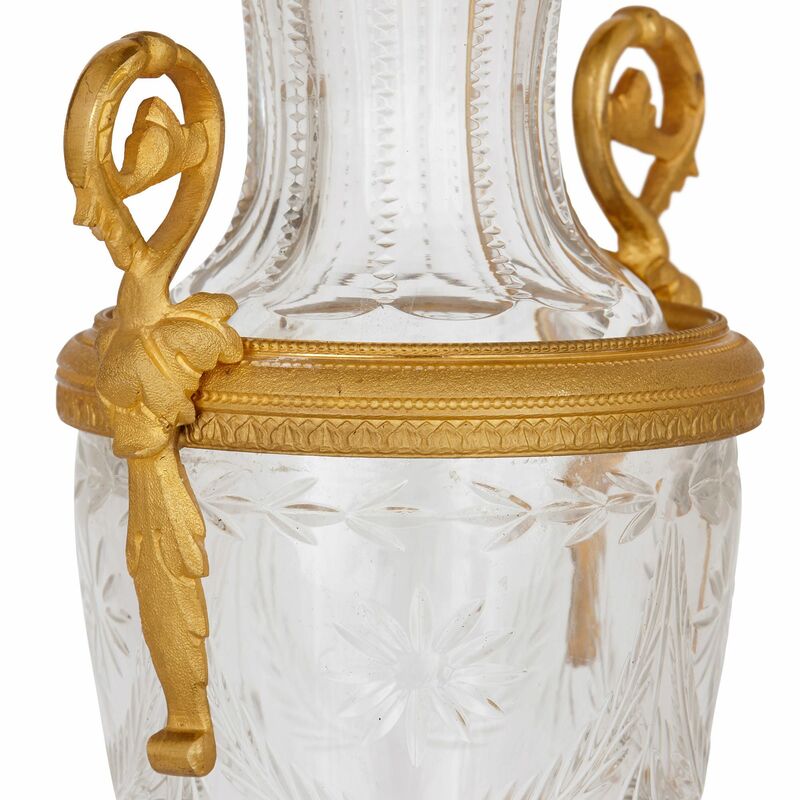 Ormolu bands encircle the vase bodies, and are fitted with vine-like handles, which curl upwards before looping back on themselves. The bodies are topped by waisted glass necks, which are delicately incised with beading patterns. 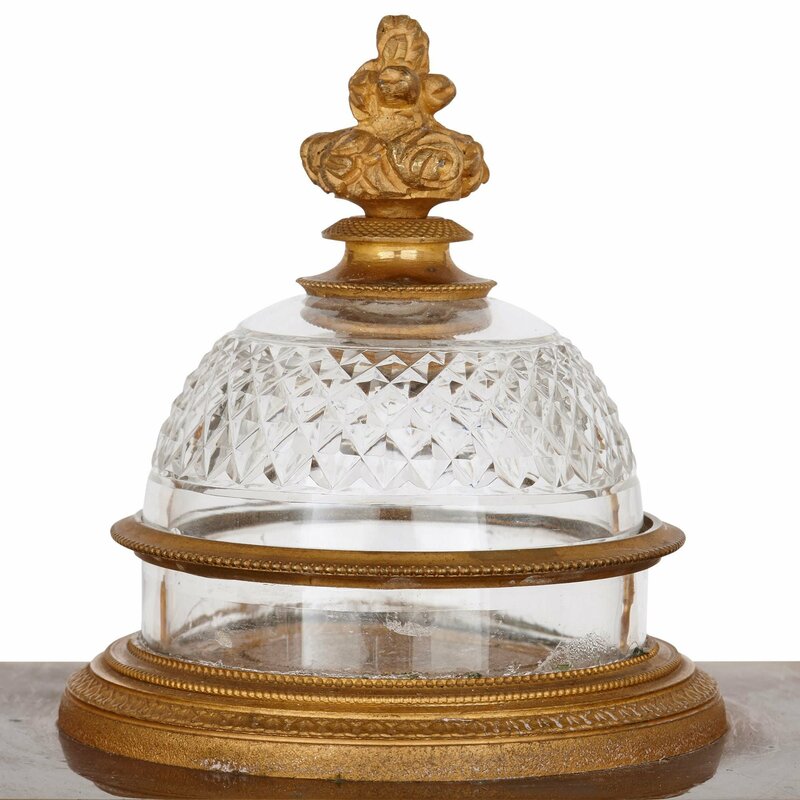 The necks are covered by lids, with ormolu lower edges, and faceted cut glass domed tops, crowned by ormolu pinecone finials.